You know when someone asks you a question so bizarre and ridiculous that it’s like they said it in Braille or you think you might have gone deaf? 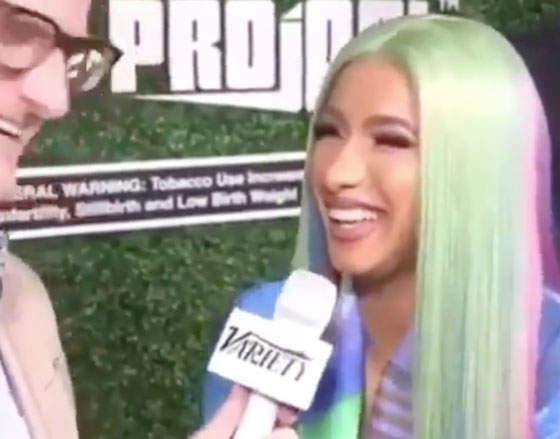 That’s exactly the moment Cardi B experienced at Swisher Sweets’s 2019 Spark Award Party in West Hollywood on Friday night when Marc Malkin of Variety asked her if she’d ever make up with intended human shoe rack and arch-nemesis Nicki Minaj and perform with her. Cardi’s face scrolls through so many face emojis (“Confused,” “Did I Hear Him Right?”, “Is This Dude For Real?”) in this clip before settling on “Hilarity Ensued” as her answer. Her Woody Woodpecker as a wicked witch mocking laughter is my new ringtone. Cardi must have kept laughing as she walked in the venue, and then on right on through the party. She was probably still laughing when she left. And she probably kept laughing in the limo, as she let herself back into her place, and even as she hung up her wig and put herself to bed.